Our product range includes a wide range of latex base interior exterior wall primer, sealoxy wall primer, acrylic based interior-exterior wall primer, wall plaster chemical, weather sol wall primer and latex base wall primer. Latex Base Interior Wall Primer is an effective undercoat for indoor as well as outdoor walls against minor moisture problems, and for higher coverage of the paint. It is a thin coat which is flexible and stable. The offered primer is the first coat which is to be applied on a dry plastered wall. 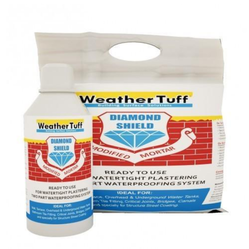 It fills the porosity in the plaster,increases the strength and makes it water resistant. It reduces the wall crack. To reduce overall painting cost, this primer is the best under the coat for the commercial and domestic structures. 1 or 2 coats as required after appropriate surface preparation. Keeping an over-coating interval of 4 hours between coats. The surface should be dry cut with sandpaper before finish coats are applied. Diluted with water up to 15% to 20%. Sealoxy Wall Primer is an effective undercoat for indoor walls against minor moisture problems and for higher coverage of the paint. It is a thin coat which is flexible and stable. Sealoxy Primer is the first coat which is to be applied on a dry plastered wall. It fills the porosity in the plaster and makes it water resistant. 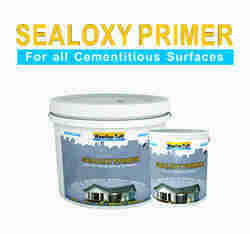 To reduce overall painting cost, Sealoxy Primer is the best under coat. 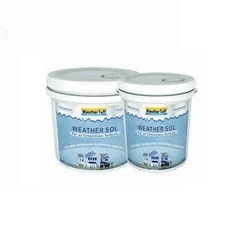 Sealoxy Primer gives 70 to 80 sq.ft coverage per Ltr per coat on smooth surfaces. Sealoxy white primer is 100% waterproofing undercoat. It gives better adhesion and longer life. Weather tuff Sealoxy Primer, an effective undercoat helps your indoor walls against minor moisture problems and keeps paint undamaged. 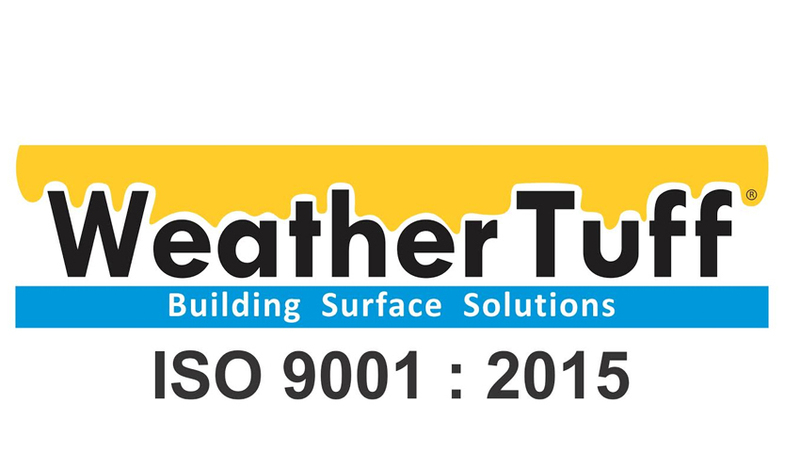 It also helps preventing moisture penetration, when applied on outerwalls. DRY Sealoxy Primer film is thin, flexible, stable and white. When applied on dry plastered walls, it fills porosity of the plaster and make it water resistant. Flexible film of Sealoxy provides protection against expansion & contraction caused by variations of heat & cold in the atmosphere. Hence, the color applied on its coating does not crack or chip. All water base colors can be applied on Sealoxy Primer. 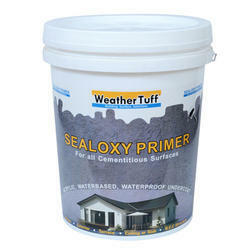 Sealoxy Primer covers 70 to 80 sq.ft.in per coats. Acrylic Based Interio-Exterior Wall Primer can be used as an undercoat for all type of walls. This primer gives an effective undercoat. It helps indoor as well as outdoor walls against minor moisture problems,to avoid cracks and keeps paint undamaged. It also helps in preventing moisture penetration, when applied on outer walls. In addition, the primer film is thin, flexible, stable and white. Apart from this, clients can get the primer from us at industry leading rates. Gives better bonding to the surface. Increases the covrage of final paint. Weather Tuff Sealoxy Primer, an effective undercoat to help your walls against minor moisture problems and keeps paint undamaged. It also helps preventing moisture penetration, when applied on outer walls. Dry Sealoxy Primer film is thin, flexible, stable and white. When applied on dry plastered walls, it fills porosity of the plaster,gives strength to the walls and make it water resistant. Flexible film provides protection against expansion & contraction caused by variations of heat & cold in the atmosphere. All water base color can be applied on Sealoxy Primer. On smooth surface, Sealoxy Primer covers 70 to 80 sq.ft.in 1 liter. With phenomenal market understanding, we are able to introduce an extensive range of Construction Chemical. Our professionals bring forth an excellent range of chemicals that are manufactured using premium quality material and latest techniques at our production unit. In addition, these chemicals are built and developed adhering to industry standards. Furthermore, our professionals opt for strict quality inspection made on the chemicals to ensure flawless performance. 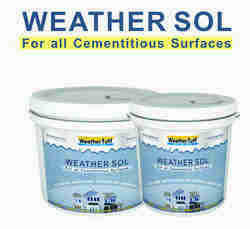 Weather Sol Wall Primer is good for all cementitious surfaces. It is latex base waterproof undercoat. Provides long lasting and effective resistance to alkali,acid attack and dampness. It is highly flexible due to latex base. Owing to the expertise of our team of experienced professionals, we are able to introduce an exclusive range of Latex Base Wall Primer. This effective primer is manufactured using quality materials and advanced technology. Our professionals manufacture all kinds of primer according to the trending demands and clients’ needs. In addition, the offered primer is built and developed adhering to industry standards. Furthermore, quality control team opts for strict quality inspection to assure flawless performance of the primer during operation. Besides, clients can get the primer from us at industry leading cost. 1 or 2 coat is required after appropriate surface preparation. Dilute with water 15-20 % according to your need. Can be applied by brush,roller or spray .